Mary Bee Jensen was a teacher and dancer. She was the founder and director of Brigham Young University’s world-renowned International Folk Dance Ensemble. In 1956, the ensemble started small, with six couples who were taught folk dancing by Mary Bee. A BYU professor who noticed their practices told Jensen to go visit Janie Thompson, director of BYU’s Program Bureau. Thompson added Mary Bee’s dancers to the bureau. She organized the first European tour in 1964. She and her husband obtained a personal loan of $26,000 to make the trip possible. During the next decades she developed the program to a position of international prominence in the dance world. Beginning with the folk dancers’ first European tour in 1964, Jensen then directed twenty-seven tours to Europe and two tours to the Far East. 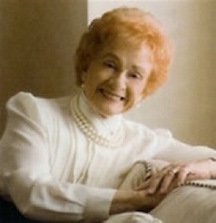 She led her students in concerts at the Kennedy Center, Lincoln Center, and in international television performances seen in Bucharest, Moscow, Poland, Bulgaria, and Hungary. Jensen was the co-founder of the National Folk Organization and was a member of the Worldwide Association for the Performing Artists Board of Advisors. She was an Honorary Congress Chair for the International Organization of Folk Art, and was the first American appointed to the World Congress as a delegate to the Council of International Organizations of Folklore Festivals (CIOFF). She served in this position for fourteen years and received the CIOFF Gold Award. She was born in 1917 in Provo, Utah, to Robert George and Mary Cuthbertson Bee. She was raised in a Presbyterian family and was discouraged from dancing. Her parents sent her to a Presbyterian college in Missouri where she obtained her bachelor’s degree in biology from Park College. Her first job was as a physical education and dance instructor at Jordan High School in Salt Lake County. After she met and married Donald Jensen, they relocated to Provo, Utah, where she played piano for a BYU PE professor and taught folk dancing. She took a temporary position on the faculty to teach archery, basketball, soccer, and dance. She joined the faculty of BYU’s College of Physical Education in 1952. She also received a master's degree in recreation education from BYU. She retired in 1985. Jensen became a member of The Church of Jesus Christ of Latter-day Saints in 1979. Jensen’s numerous awards include the BYU Alumni Distinguished Service Award, the Karl G. maser Award for Teaching, the BYU Chapter of Phi Kappa Phi’s Alumni Award, BYU’s Outstanding Woman Award, Outstanding Educator of America, and the National Dance Association Heritage Award. She received the Lifetime Achievement Award from the Utah Dance Education Organization and received the Days of ‘47 Progress Award in the historic and creative art category. In December 2009, Jensen was honored at the 50th Anniversary of “Christmas Around the World” for beginning the production. The following year, she was presented with the Franklin S. Harris Award in recognition of a lifetime of exceptional service and professional achievement as a dance educator and artist at BYU. In 2013, at the SCERA's annual "Evening of Stars" gala, she was recognized for her extensive service to and efforts in the field of art. In 2015, she was one of the alumni highlighted by the College of Fine Arts and Communications for the celebration of the 50th Anniversary of the Harris Fine Arts Center. Jensen passed away on April 13, 2018. She was 100 years old. This page was last edited on 30 April 2018, at 22:22.